With the arrival of spring, the invasive shrub called French broom is popping up all over Sonoma Valley. But French broom is environmentally destructive, a fire hazard, and very hard to control. To slow its spread, we are inviting the public to take part in two outdoor “broom pull” events on April 13 and April 22. These are family-friendly events where volunteers join us in a beautiful outdoor location in Sonoma Developmental Center to help restore burned sites that need a little TLC. Gloves and tools as well as drinks and snacks will be provided. Please wear sturdy shoes and clothes you don’t mind getting dirty in. All ages are welcome (children must be accompanied by an adult). Heavy rain will cancel. For more details see this blog post. Directions: SEE THIS MAP. 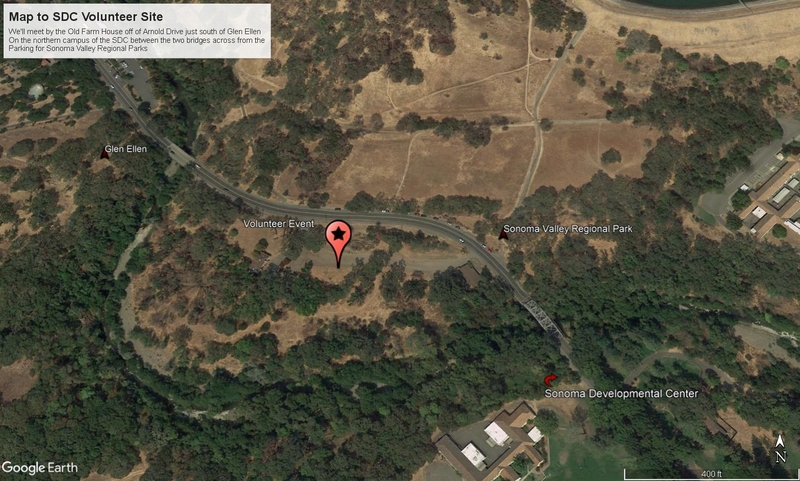 We will be meeting in the parking lot of the old farmhouse/superintendent house on the SDC campus, located along Arnold Drive across from the parking area for Sonoma Valley Regional Park. This is the northern part of SDC between the two bridges crossing over Sonoma Creek.